Louisville, Kentucky: On a late autumn afternoon in October 2000, Louivillians Alan Gentry, Don Fightmaster, Bill Frey, and Scott Lusk (of nearby Guston), met in a downtown Irish Pub to discuss the formation of a one-armed golfers’ organization. They conducted the first organizational meeting that day, and appointed Mr. Gentry as its first president. Eight months later in June 2001, 32 one armed golfers from across the USA came to Louisville and competed in the first NAOAGA championships. 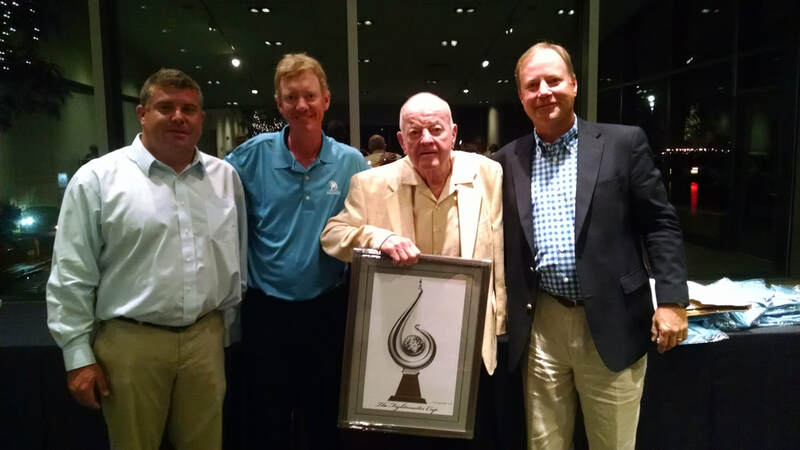 In addition to Gentry, Scott Lusk, Tom Hartnett and Bill Frey, Jr. have served as past presidents of the organization. Daniel Aldrich is NAOAGA's current president, having been elected in July, 2017. Since that inaugural year, the NAOAGA annual meeting and championship (AM&C) has been held each year at a different venue across the North American continent. The AM&C has been held in the West (Nevada twice) and Midwest (Indiana twice and Chicago), Canada (Montréal and Prince Edward Island) and the South (Kentucky and Florida three times). The 2017 event in Michigan marked our 17th anniversary. Over 240 one-armed golfers have joined the organization to date, and players from several US states, Canadian provinces and Mexico, as well as players from England, Ireland, Scotland, Sweden, South Africa, Australia and the United Arab Emirates have participated in the AM&C. In 2008, 2010, 2012, 2014 and again in 2016, NAOAGA joined forces with the United Kingdom's Society of One-Armed golfers to play in the world's only international one-armed Ryder Cup-style competition. The event, named the Fightmaster Cup after one of NAOAGA's founders, will be returning to Europe in 2018. Europe currently holds the Cup. NAOAGA is an IRS 501(c)(3) charitable organization that was created and is operated, "by" and "for" its membership, and the organization is strong and growing.